This unscientific, unethical, and unwarranted wolf cull is a consequence of industrial logging and other human activity, which have transformed the caribou's habitat into a landscape that can no longer provide the food, cover, and security these animals need to survive. 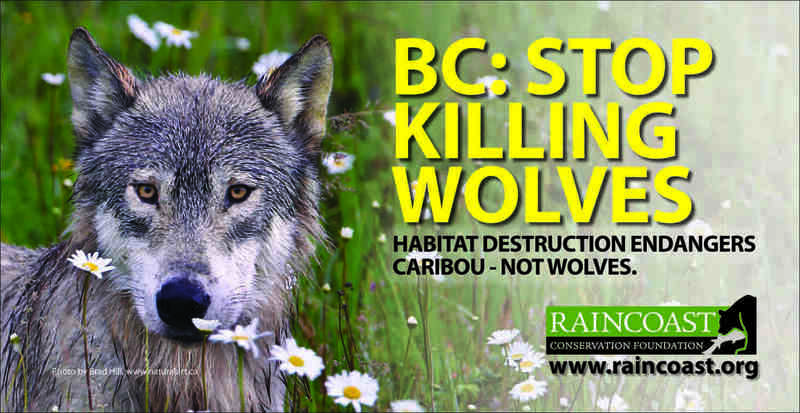 Raincoast Conservation Foundation has launched a billboard information campaign addressing the inhumane slaughter of wolves that is occurring at the hands of the province of British Columbia. For at least the next five years, the B.C. government intends to kill hundreds of wolves by means of aerial gunning in the South Selkirk and South Peace regions of the province. The province is marketing the slaughter as a conservation plan to “save endangered caribou.” The provincial Ministry of Forests, Lands and Natural Resource Operations recently announced the first phase of the killing has been completed with an initial body count of 84 wolves. This unscientific, unethical, and unwarranted wolf cull is a consequence of industrial logging and other human activity, which have transformed the caribou’s habitat into a landscape that can no longer provide the food, cover, and security these animals need to survive. Rather than address the real problem, i.e., the destruction of life sustaining caribou habitat, the B.C. government has chosen to scapegoat wolves. The aim of Raincoast’s billboard campaign is to bring attention to that deplorable decision. This politicization of wolf management, and associated willful neglect of the best available science, has become ingrained and institutionalized within the provincial government bureaucracy responsible for the management of large carnivores. The result is the ongoing persecution of B.C.’s wolves by way of a seat-of-the-pants, shoot-first-ask-questions-later approach toward the species. The conservation group Wolf Awareness Inc. has just attained the B.C. government’s operational plan for the South Peace wolf cull through a Freedom of Information request. Reading through the document, “Experimental Wolf Reduction to Enhance the Recovery of Threatened Caribou Herds in the South Peace,” provides insights into the truly experimental nature of the wolf cull, as the title indicates, and confirms what critics have been asserting all along; slaughtering wolves to ostensibly protect caribou has no basis in scientific fact and is a desperate, and ultimately futile, attempt to compensate for the devastating impacts of habitat destruction. But the current wolf cull is only part of that aforementioned persecution; more than 1,000 wolves are being killed every year, the overwhelming majority for “recreational” purposes and by resident trophy hunters. This staggering annual mortality is being directed upon a wolf population that, according to B.C. government estimates, approximately numbers half that of the provincial grizzly bear population. 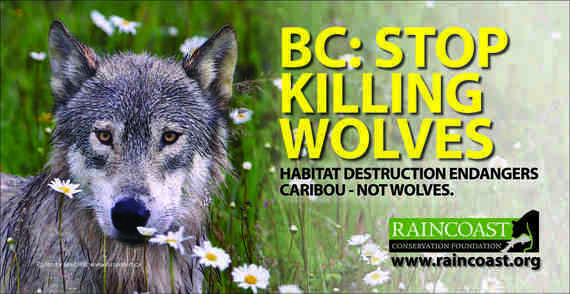 As Raincoast’s first wolf cull billboard in Greater Victoria states, habitat destruction endangers caribou – not wolves.